The Kissimmee Boat A Cade is an annual small boat event that has taken place every year in June since 1950 and starts in Kissimmee on Lake Tohopakaliga. Every year the Kissimmee Boat-A-Cade takes a trip somewhere in Florida and quite often beyond. Hundreds of boats travel together and go to a wide variety of places. 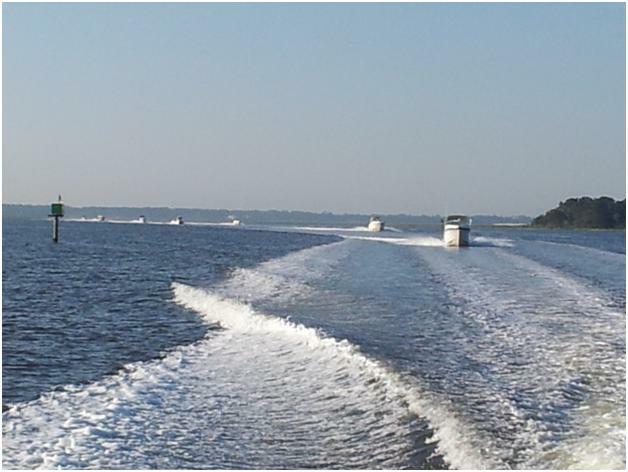 They stop at marinas and campgrounds along the way and enjoy fellowship and good food and drink. Florida is blessed with hundreds of rivers, miles of intracoastal waterways, numerous lake chains and an endless variety of scenery. The Boat-A-Cade is a fantastic and unique way to see dozens of Florida species of birds, reptiles and other water oriented creatures up close and personal. This event has been around since 1949, and has traveled the Kissimmee Chain of Lakes and gone down the Kissimmee River to Lake Okeechobee. From the big Lake O, the Boat-A-Cade has jumped west sometimes along the St Lucie River to the Intracoastal Waterway on the east coast, and from there on down to the Florida Keys or even north along the ICW to Charleston, South Carolina. Other destinations from Lake Okeechobee have included the Florida Gulf Coast by way of the Calooshatchee River to Fort Myers and Sanibel Island. They have even ventured as far north as Biloxi, Mississippi. Each trip is an adventure that all who participate will remember forever. Until now I've always had sailboats, but I see a power boat in my future so I can make one of the annual trips. The boats are limited to power because they have to make a certain number of miles each day. My many friends who have made one of these trips say the camaraderie and fellowship is something to remember for the rest of your life. More information is available at the Kissimmee Boat-A-Cade website. The Kissimmee Boat-A-Cade also has a Facebook page with a lot of neat photos.